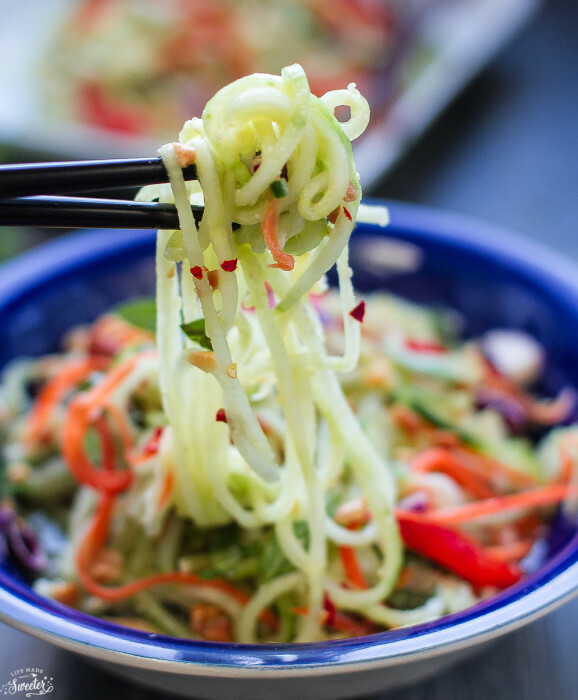 Asian Zucchini Cucumber Noodle Salad makes the perfect healthy, gluten-free, noodle dish. Best of all, it’s easy to customize and full of flavor. Zoodles are one of my favorite things to make when we have an abundance of garden zucchini. This Asian Zucchini Cumber Noodle Salad is fresh, filling and full of flavor. It’s light, healthy and the colors are gorgeous. There’s zucchini, cucumbers, carrots, purple cabbage and a bell pepper. The dressing is made with peanut butter (you can sub in almond butter as well), rice wine vinegar, honey and a little bit of sriracha for a spicy kick. And if you have some on hand, toss on some chopped Thai basil, mint and cilantro to complete the dish. The flavors are spot on with the sweet, salty and spicy that you would expect from a Thai dish. 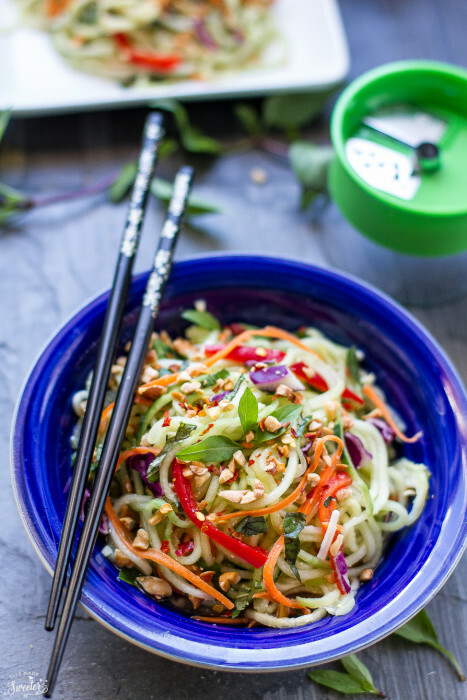 Plus, this Asian Zucchini Noodle Salad is bursting with fresh herbs and crunchy nuts. 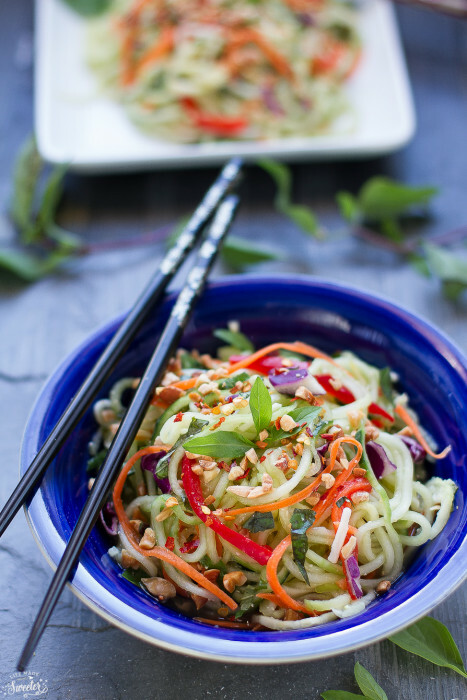 This Asian Zucchini Noodle Salad is also gluten free and really hits the spot when you are craving something healthy and delicious. 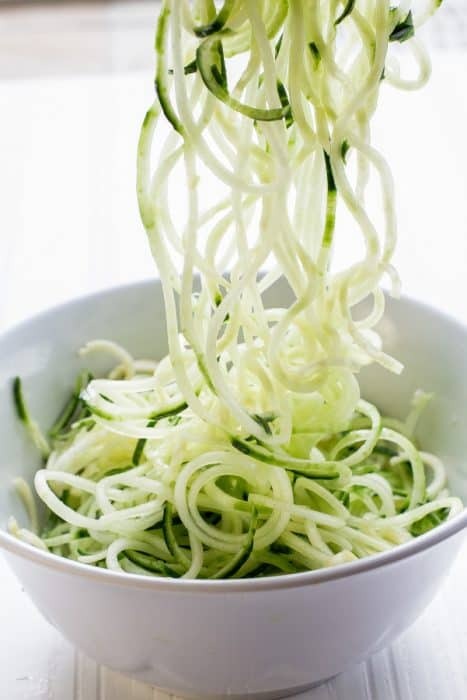 Asian Zucchini Cumber Noodle Salad makes a healthy, gluten-free noodle dish that is flavorful, bright and great served as a main dish or side dish. In a large bowl bowl, whisk together the lime juice, almond butter, grated ginger, rice wine vinegar and sesame oil.. Season to taste with chili flakes, salt and pepper. Peel the zucchini, cucumbers and carrots. 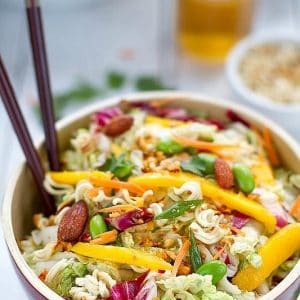 Use a spiralizer, julienne peeler or mandolin to turn the zucchini, cucumber and carrots into “noodles.” Add to the large bowl with the dressing along with the bell peppers, purple cabbage, cilantro and Thai basil. Toss everything well. Garnish with peanuts and more Thai basil and cilantro if desired.